On 21 January 2014, the Luxembourg-based General Court of the European Court of Justice ruled that the European Platform Against Windfarms (EPAW) does not have “legal personality,” and therefore had no right to initiate a recourse in its chambers against the European Commission. EPAW represents 649 associations of windfarm victims across Europe. It had brought a case against the European Union, denouncing Brussels’ new renewable energy targets for not respecting the rights of citizens to participate in environmental decision-making under the provisions of Aarhus Convention legislation. Yet in a judgment dated 18 January 2007, the Court of Justice had declared admissible an appeal by the Kurdistan Workers' Party (PKK), an organisation with no legal personality, based outside the EU, and with a history of armed rebellion. The Court had then given value to the argument that "it is a question of avoiding excessive formalism” (case C-229/05 P). Initially, the General Court had admitted EPAW’s recourse, and had processed it. 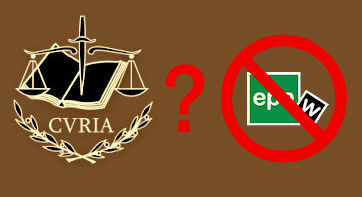 Indeed, unincorporated bodies based in Ireland such as EPAW do not have to be constituted as registered associations to have certain rights regarding environmental matters. The Irish Supreme Court even confirmed on 27 November 2013 that in similar circumstances unincorporated bodies could bring matters into proceedings at the Irish High Court. These bodies argue that, lacking both time and resources, many groups of citizens cannot spend precious energy and money drafting legal statutes, organising annual assemblies, writing minutes, doing secretarial work and filing reports to government(s).